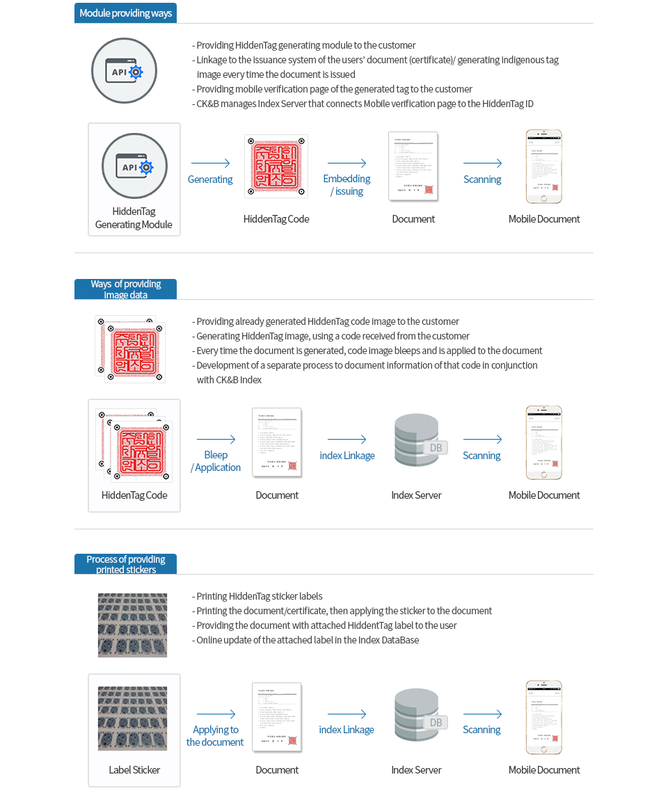 HiddenTag for Document enables inserting authenticity information inside the corporate logo or seal on the official letter of private or public organizations, requiring no further scanner, which can be easily detected by a Smart device. With HiddenTag for Document, you can preserve the value of your on/offline information. HiddenTag Document cannot be imitated. 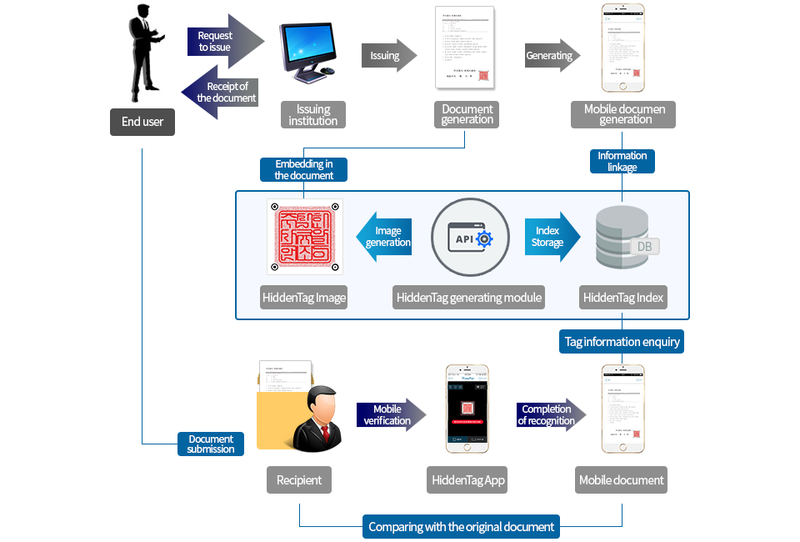 Accordingly, during document forgery the data of the original document is detected on the copied HiddenTag, not matching the content of the document. After saving the document content in 2D Barcode, it is compared to the original document through barcode decoding. For barcode decoding exclusive or general-purpose scanner is needed. Accordingly, barcode detection program or web server linkages are required. The content of the document is saved in QR code and can be easily checked through smartphones. Thus, anybody can imitate QR code; moreover, the landing page may also be forged. Through seals, marks, and various images it is possible to detect the forgery. The image can be embedded both on smart stickers, and through individual printing. Even though all the images of HiddenTag for Document look alike, they all carry different information. By inserting the original information without damaging the standards of the document it is possible to check the document for forgery. 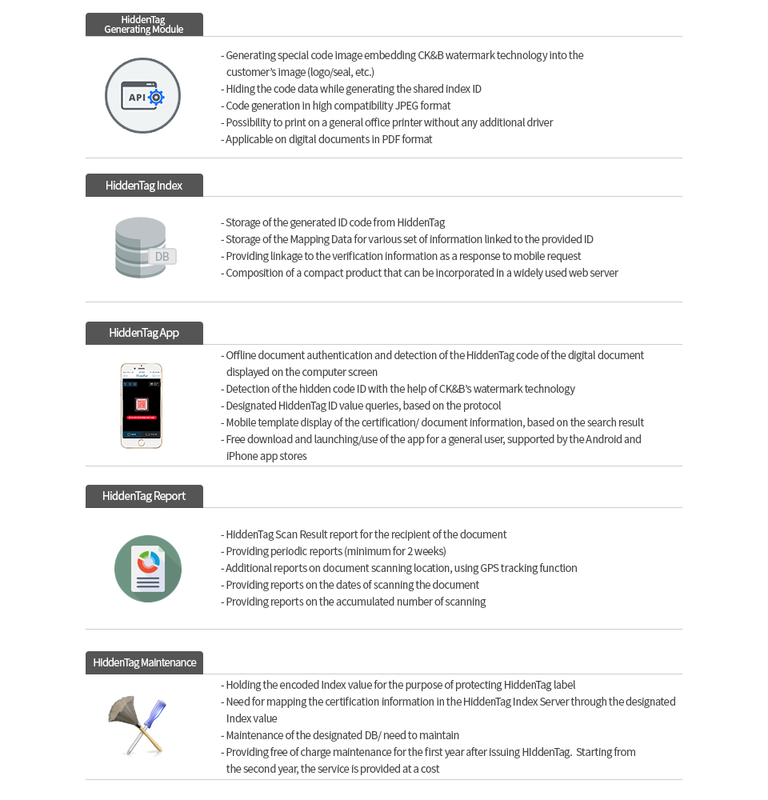 HiddenTag enables you to verify the product authenticity through the mobile application, without requiring any other scanner or program. The application can be downloaded from the App store, Google play, and the Chinese app markets.